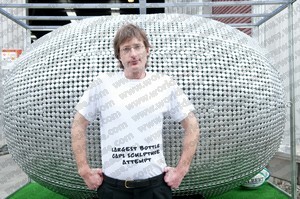 This is the story behind our Guinness World Record™ for the Largest bottle cap sculpture. As I think of the recent happenings in my world record-breaking life, only three words can describe what we’ve overcome: a virtual impossibility. I’m mentally drained, physically exhausted and emotionally frayed. But I’ve got to be ready for media enquiries at any time, so I’ll keep going to the very end. When devising this challenge, I wanted to create a world record attempt which would provide a different mental and physical challenge. After much pondering over various world records, I decided to aim for something that could be unveiled to the world as part of Guinness World Records™ Day on 18th November 2010. A few more sips from my bottle gave me just the inspiration I needed - why not create a sculpture of a rugby ball from bottle caps. The rugby ball design was reproduced with the consent of Gilbert Rugby, who have been chosen to produce the match balls for the Rugby World Cup 2011 in New Zealand. This is the 5th consecutive world cup for which Gilbert have supplied the official match ball and they have also been appointed for 2015, so it made sense to work with them and their iconic design on this project. Replica match balls are available from Lovell Rugby. When a bystander for this world record attempt suggested I write a book about the extreme challenges faced from my viewpoint, I decided to pen a list of notable events instead. There is much more. Bear in mind that over a dozen of the negative influences listed below were in full effect continuously, and sometimes up to twenty were bearing down on the project simultaneously. May I suggest you open a bottle of liquid refreshment, sit back and contemplate what we did – and cultivate a newfound respect for metal bottle caps, like the one on your thirst quencher. This may help get you in the mood for rugby, but if you really want to get prepared for as much rugby as possible, then why not get a Sky TV sports package in time to watch the sport? Bear in mind that when I began, I had no transport, no budget, no team, no experience, no resources, no workshop and no venue. Oh, one more thing… if you see me in the street, the most insulting thing you could do is ask me to solder thousands of bottle caps in celebration of something you’ve got planned. Rather than bite your head right off and chew you to a pulp, I’ll try to smile and reply, “Please contact me when it’s done”. To any aspiring challengers, secrets the team learned are available here. So, what were the challenges that we faced and which could have easily disheartened the team? Most appropriate project description: "a virtual impossibility"
The Health and Safety aspects of this project also deserve a mention. Most pleasant long-distance legal introduction: due to the time difference, I had to ask a British attorney if I could go to bed when introducing myself; she laughed... from the opposite point of the earth. Now, how did we manage the publicity around the unveiling of this world record attempt and manage to keep it out of the press before the official launch date? Licensing agreements: Gilbert Rugby offered a license to use their trademarks just 82 hours before photos went worldwide. Immediately prior to this, the media material had been rewritten - following an emergency plan - to launch the sculpture as an Unidentified Mobile Object. It should also be noted that the work connected to a world record is never complete quite as you would expect. Alongside all of the paperwork which has to be completed in order to verify the record attempt and obtain ratification from Guinness World Records™, there is all of the surrounding international media interest to deal with. Technology is a god-send, but it can also lead to further unforeseen issues. For example, having submitted a press release about the project to various agencies, I ended up receiving 7,138 duplicate replies from 2 emails addresses over 24 hours; calls to the USA and Europe were necessary to stop it because these emails bypassed electronic filters! Oh the joys of spam. This project was so stressful for many involved, that my core team even began to distance themselves from commitment toward the final stages. If a journalist or interviewer reads the above and asks me if I’ll do this again, expect me to think their intellect is faulty – and to respond by saying so. The New Zealand sports star, Sir John Walker, cut the ribbon at the sculpture's first display at the Botany Town Centre in Auckland. He was also kind enough to sign one of the Gilbert rugby balls. Sir John Walker is well known as a former middle distance runner, and is best known for setting his own Guinness World Record™ in August 1975 by being the first person to run the mile in under 3 minutes 50 seconds. During his sporting career, he also held other world records, breaking those for running 1500 metres (indoors) and 2000 metres. Since then, it has been wonderful to see this reasonably well-travelled massive bottle cap sculpture come to its final resting place. It is on display at the correct angle for kick off, where it greets visitors to the New Zealand Rugby Museum. No display venue could be more appropriate for a world record sculpture about a sport which has claimed so many sporting world records around the earth. With great joy, I take pride in knowing my work has landed in a museum of great international stature in the name of rugby, alongside items from the renowned All Blacks. Of all that the ‘ABs’ are recognised for, the global sporting community – including All Black traditional rivals, the Springboks and Wallabies - knows this team’s haka from the Bledisloe Cup and Tri Nations. And now my work is amongst the very museum dedicated to these icons in New Zealand rugby, including contemporary favourites Sonny Bill Williams, Jonah Lomu, Richie McCaw and Dan Carter, as well as the sensational Colin Meads. 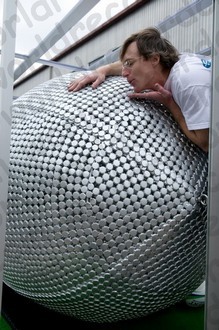 Could these have become some of the most famous 19,205 metal bottle caps in the world of rugby? Quite possibly yes, with a huge thanks to the wonderful people at Juralco Aluminium Building Products Ltd and www.bkwsu.org. In addition, excellent contributions came from Resene Automotive, Woods, Chemetall Tergo, Output Images, RJG Carriers Ltd, McDonald's Point Chevalier, Carlton Rhodes, RS Components Limited, Mackenzie Lacquering & Powder Coating 2004 Ltd, GF Appliances and Auram Engineering Ltd.